Jerrilee Cain perches on a stepladder in the former kitchen of her historic home in Worthington, applying the fourth coat of finish to floor-to-ceiling paneling beside the broad brick hearth. Her hand moves evenly, methodically over the brown-stained wood, which glistens under the clear glaze. She is dressed in her usual painting attire: untucked, faded flannel shirt, loose khaki work pants, wool socks and white slippers. Thick waves of light blond hair cap her face, framed by huge tortoise-shell glasses. At 76, she is strong and sturdy, a Midwestern farmer's daughter who still delights in a solid day's work -- of which she's had plenty lately. For the past four years, Cain has devoted herself almost entirely to the rebirth of this house -- a 1703 timber frame taken down 10 years ago in Glastonbury, Conn. She bought it sight unseen -- as a cargo trailer full of boards, beams and bricks -- after falling in love with photos of the interior in a flier a friend picked up at a restoration conference. Cain was particularly taken with the great room, which still had the original horizontal featheredge sheathing, raised paneling and exposed beams. "I bought the house mainly for that room," she says reverently. This is Cain's third home restoration. The first two -- Worthington's Parson Huntington house and the Lewis Damon house in Chesterfield -- were both 18th-century homes passed down virtually untouched through generations of the same family. Through them, she perfected many preservation techniques. But she has never tackled anything like this: the ground-up restoration of a completely disassembled structure. It's a full-time retirement project -- long days filled with scrubbing, scraping, staining and puzzling out solutions to missing and altered pieces. She's up at 5:30 a.m. and, after a morning ritual of journal and poetry writing, is typically on the job from 9:30 to 5. It's been a massive -- and expensive -- undertaking. Though she paid only about half the original asking price of $70,000 for the disassembled pieces, putting them back together is costing upwards of $500,000. "I am not a wealthy woman," says Cain, who retired 10 years ago after a long career as an art teacher, art therapist and university administrator. The sale of her Chesterfield home, which she spent 20 years restoring, has covered most of the cost. Her biggest investment, however, is sweat equity. Arrayed behind Cain today, on end-to-end workbenches under multipaned picture windows, are cans of wood stain, boxes of old-fashioned milk paint, jars of powdered pigment and dozens of wood scraps -- each painted with a slight variation of the same reddish brown, along with Cain's handwritten recipe for creating it. She has spent two weeks working to get the depth and hue just right on 6 feet of reproduction paneling bordering the fireplace and beehive oven. Finally, she has settled on four different layers of finish -- each of which must be brushed on, wiped off and allowed to dry for a day (all in a specific order) -- bringing the wood close to the appearance of the original, 240-year-old pine above the oak lintel. It's a level of detail that would drive most people crazy -- and has in fact been frustrating for some of her contractors. But for Cain, it's pure pleasure. "I'm addicted to this," she admits with a laugh. And she's good at it. The secret to her magic lies in her ability to attend to minutiae without losing sight of the greater goal: a home that embraces the spirit as well as the body. In fact, restorations are most successful, she believes, when the heart guides the hand. Cain's passion began with an epiphany 55 years ago. "I was a sophomore at the University of Missouri. I was sitting in an art appreciation course, and they flashed on the screen the Whipple House in Ipswich," she recalls, "and -- zonk! -- that was it. That was home." It made no difference that the Whipple House, a gem of early American architecture built in 1677, bore no resemblance to the 20th-century Illinois bungalow and 19th-century Missouri farmhouse in which she was raised. There was just something about the massive, exposed beams, the cavernous fireplace and the broad floorboards that drew her in. Cain immediately immersed herself in the era, haunting flea markets and antique stores, investing every extra penny in early furniture, fabrics, cupboards and lumber -- many of which now grace this latest project. She moved to the East Coast in 1952, when her then-husband took a job at General Electric in Pittsfield. Here, she found an even richer source for 17th-century materials, along with some rare opportunities. In the 1960s, for example, she had the chance to visit scores of unimproved 17th- and 18th-century homes in Newport, R.I., opened to the public in advance of urban renewal. "I'm getting goosebumps" just remembering it, she says. "That was so thrilling. I bet I went down there four or five times before they started the restorations." It was there she honed her eye for traditional paint, plaster and woodwork treatments. Finally, in 1968, she and her husband bought the home of their dreams: the original parsonage of Jonathan Huntington on West Street in Worthington. Federal style on the outside, it was flush with older, 17th-century features inside -- and in desperate need of major structural repair. They quickly set to work. When the marriage ended two years later, Cain soldiered on alone, teaching art in the Gateway Regional School District and later commuting to Albany to work for the New York Department of Education. She sank every spare dollar and hour into the house. In the end, though, "I couldn't afford it," she says. "I was starving and freezing, but I had to finish it to sell it." Signing the sale papers in 1978 was, she says, "the saddest day of my life." She returned to the Midwest to help her parents move from their farm after her father developed Alzheimer's. She tried to make a go of it there, launching a private art therapy practice and working as an administrator at the Western Illinois University College of Fine Arts. But, she says, "selling the house and going back was like death. For the 16 years I was back there, this was home." In 1985, in preparation for retirement, she bought the Lewis Damon house on East Street in Chesterfield as a second home. Barely changed in two centuries, it had no central heat or insulation. Water was piped from a nearby pond, and electricity came from a single outlet and a web of extension cords. She spent a decade of summers there, working on the house, then moved in full time in 1996, after retiring. Over the years, she restored it to the look and feel of its earliest days. Stepping inside was like stepping back in time -- dark, earthy spaces furnished with period fabrics, art, pottery and furniture. Cain's experiences there formed the basis for a book she published in 2001, "Hestia Come Home." An academic meditation on the psychology of place and home, it draws on her 10 years of Jungian training analysis, which she used in her art therapy practice. A Swiss psychiatrist and artist, and a contemporary of Freud, Carl Jung believed in the unconscious power of archetypes and symbols, and the importance of delving into the world of dream, myth and soul. "I believe that in each person there is a felt -- though sometimes blurred -- image of home," Cain writes in "Hestia." "We all know what it feels like. ... Home is a familiar, a place we know without trying, a place that sings in harmony with our heartbeat, with the flow of our awareness, both conscious and unconscious." But, she stresses, it is not necessarily a place we've actually known. 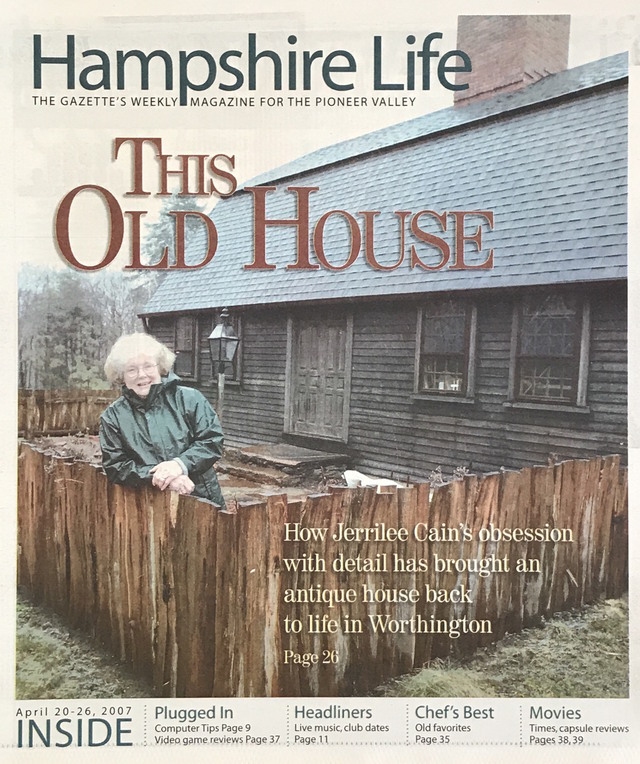 Just as the Whipple House "was a symbol that ignited some archetypal meaning in me," so the primitive "Hestia house," as she lovingly calls it, was a channel for those instinctive longings. "There's something about an old house that's come out of the earth around it that you feel," says Cain. "You go down in the basement and, yeah, there are snakes and mice, but there are the stones the people laid that came out of the land." Her reverence extends not just to the way each home was created -- from trees felled on the same land and planed by hand -- but to "the organic way people lived" then, their daily lives entwined with nature's rhythms. Says Cain, "I just like to see if I can capture it and bring it back." That challenge and the lure of early features not found in her other homes -- like the wooden wall covering known as featheredge sheathing -- convinced her to take on the new project. She also knew she had to be practical. She was approaching 70 and her close friend, Richard Law, who was struggling on his own, was planning to move in with her. There was no separate space for him in the Chesterfield house, and no room to build one, and he was facing health problems she knew would be hard to deal with there. The reassembled house would include a large new wing -- designed in a mid-18th-century style and built using mainly period materials -- with a bath and studio for Law, a modern kitchen, an attic and a garage. "You do what you need to do," Cain says philosophically, and for better or worse, "I never look back. I never turn around. & If I miss the road, if I miss the ramp, I just keep going and find another way." Still, it's been a giant leap of faith, fraught with complications. "I was very young then. I was only 68," she says with a smile. "Had I known at 75 I would still be working hard, I probably wouldn't have done it. ... My obsession ruled my good sense, and it's still got a hold over me." Cain trades her paintbrush and can of stain for a paper towel, and wipes the wet finish off the wood. From the next room, behind a sheet of clear plastic tacked across the open doorway, comes the soft clunk of lumber being moved. Stuart Harris of Harris & Gray in Ashfield, a restoration woodworker hired by Cain to work on the oldest spaces in the house (the two front rooms and the front foyer), has set up shop in what eventually will be the parlor, restored to 1767, the year the paneling was updated and the former kitchen added across the back. For now, it's an empty shell, outfitted with temporary workbenches. Behind him, leaning upright against the fireplace wall, are several antique floorboards, each close to 2 feet wide and weathered by an assortment of dips, grooves, cracks and holes. Harris has just removed one and laid it gently across the bench in front of him. To Cain, these floorboards are solid gold -- treasures purchased from salvage yards over the course of four decades and lugged with the rest of her collections to the Midwest and back. She spent two years working full time to prepare the more than 100 floorboards -- both salvage and original -- used in this house. She knows every one by heart, having handled them for hours, chemically stripping off centuries of paint, cleaning the backs with a wire brush and scrubbing the fronts with steel wool to bring out the old patina. As she finished each, she added notes detailing for her workers the repairs she wanted made. "1. Pull in big crack -- I think it will come to 1/8" which is OK.
"3. The knot hole -- how I wish it were still there -- let's talk about what to do with it." Harris smiles as he reads the message. "Rarely do we have this much consultation," he says of his clients. But he's game. He and Cain have an easy rapport, having worked together on the Hestia house, and he's every bit the match for her precision. Tall and slim, with close-cropped graying hair and angular features, he leans over the board now, running his right hand tenderly along the cracks. He presses the edges together, testing the give as he contemplates a solution. His manner is steady, deliberate, respectful. Harris, 55, has been in the restoration business for most of his adult life. Like Cain, he has a reverence for old homes (his own in Ashfield was built in 1790) and a fondness for the mental challenge of period work. After deliberating silently, Harris decides on long, slender screws drilled in from the edges to pull the splits together. (He eschews glue whenever possible, preferring repairs that can be easily undone if necessary.) He carefully draws the plank in with duct tape and sets to work. After two full days of tightening fissures and hand chiseling surface patches from old lumber, he has almost finished fixing three of the five floorboards that will grace the front entry. Like everything about this house, it's not a job that can be rushed. Finding tradespeople willing and able to work with old materials -- and hew to her vision -- hasn't been easy. Through the years, Cain has come to trust just a handful of area carpenters, masons, plasterers and blacksmiths. She called on all of them -- and more -- for this project. After asking around, Cain offered the job of general contractor to Kent Hicks of Worthington, a highly regarded builder and fine woodworker. Though at 47 Hicks has years of experience restoring older homes and constructing new ones, he'd never put a dismantled house back together from scratch -- or worked on one this old -- which was both daunting and appealing. He also had never worked for someone as exacting as Cain. Ultimately, he was drawn by the challenge and by her knowledge and enthusiasm. "She has such an appreciation for that era, it's contagious," says Hicks. "I knew this wouldn't be a profitable endeavor. It was more about getting an education -- some of it in ways I hadn't anticipated. ... I went through I don't know how many finish guys because she didn't want them working there. She didn't think they had the feel." At one point, Hicks says, he spent nearly two days replaning the kitchen paneling he'd just created and installed after Cain noted the rise and groove of the beading varied slightly from the 18th-century wall he was copying. "I like that she's so fiery," Hicks says, "but it's kind of draining." Cain says it's been equally exhausting for her, having to supervise every detail to get the historic accuracy she wants. "You have to have a feel for it, because there are no rules," she says, adding, "I have an emotional investment in it they don't have." Restoration philosophies differ from expert to expert, so at the start of the project, Cain and Hicks made several visits to Historic Deerfield, where they studied two of the oldest houses and discussed the features Cain did and didn't like. Restorers tend to follow one of three main approaches, Cain says: refinishing surfaces with fresh paint in historically accurate colors to make them look as they would have when new; stripping off modern finishes to recover or replicate the original, aged patina; or leaving things as they are, with a mix of old and modern, to show the progression over time. She falls firmly in the second camp. She also is adamant about imperfection. The key to effective restoration, she maintains, is the nuances: the door jambs and windows that don't quite line up; the shelves of varying widths and thicknesses, fixed irregular distances apart; and the woodwork marked by the subtle dips and rises of hand planing. "It's that kind of little 'wrongness that's right' that you have to have a feeling for," says Cain. "When you go into a house and it's done this way, it looks old. You go into a house where they didn't do this, and it's sterile. It feels wrong." It wasn't until Hicks and Cain finally opened the cargo trailer that Hicks began to grasp what he'd gotten himself into. There were many more missing and damaged pieces than they had expected, and as they puzzled it out, it became clear the measurements and diagrams were not wholly reliable. Hicks enlisted John Otis of Goshen, a structural restoration specialist, to work on the frame. Otis assessed it timber by timber, and crafted the missing beams in his Goshen shop, hand hewing and hand planing those that would show. Some parts of the structure had to be reinforced with steel. In truth, says Cain, "I don't see how they could have saved the house without taking it apart." Otis raised the frame with the help of a crane, then completed it over several steamy weeks in the summer of 2004. Working alone at the edge of the vast field where the house is sited, he spent a lot of time reflecting on the men who first handled those timbers. He found their "marriage marks" -- Roman numerals cut into the beams to show how the joints match up -- and studied the slices of their hand hewing. "You catch these beams in just the right light, you can see all the scallop marks from the broadax -- you can see all the little nicks in his blade," said Otis. "You can tell they were pretty strong, and they were working pretty fast." Otis has studied early construction techniques extensively and reveled in the chance to step inside the minds of the original builders. He was so taken with the experience that the following year, he bought his own pile of pieces -- the Noah Parsons Jr. house, a 1755 saltbox taken down on Old South Street in Northampton in 2003. He will begin erecting it in Williamsburg this summer for later sale. Harris has moved on to chiseling a 1-inch patch from a scrap of antique lumber when Cain appears in the parlor clutching two small, black nails. The cargo trailer contained not a single piece of hardware, so Cain has had to supply it all. Some has come from her collection. The rest has been hand forged to her specifications. The period hinges and latches are being reproduced by Williamsburg Blacksmiths, based on her tracings of the original imprints and on a period latch from an early Connecticut door. She and Law have spent hours straightening antique nails, given her over the years by friends and family, often as cherished Christmas presents. But most of the nails -- some 2,000 or more in six styles -- have been forged over the course of the project by Woodbury Blacksmiths in Connecticut. "This is more the shank we want," Cain observes, bending down to show Harris a small, squared nail. "For the window trim, I was wondering if this is too coarse," she offers, displaying the second. "So maybe use this [style] but batter the heads a little bit?" "I've certainly never worked with someone like her, who puts that kind of thought into things," says Hicks. "It's not just a home; it's very thought-out -- every board, every nail is thought out, the shape of the nail, the direction it's going, how many nails go across. I don't think the old guys put that much thought into it." Cain's efforts don't end with the building itself. Outside, she has created period flower and herb gardens, limited almost entirely to plants that would have been available to early settlers, along with stone walls and a hand-split stockade fence modeled after one at Plimouth Plantation. Despite all of this, Cain says the house still feels too new, in part because it's so solid and crisp. It has a cement foundation and basement, modern insulation, heating, electrical and plumbing systems, and fire-resistant roofing shingles. The snug windows are reproductions, copied by Architectural Components of Montague from the original sashes. When she and Law first moved in after the new wing was completed in 2005, she says, "I felt like I had come to a resort in the Swiss Alps, and I was relaxed and being taken care of, but it didn't feel like home." That has abated somewhat as the interior of the old section comes together -- all but some final finish work is done. But she knows it will never completely go away. The house "didn't grow out of this ground," she says. "It belongs in Glastonbury, Connecticut. ... It will never be the same, even though it will function far more efficiently." Cain's desire for conscious imperfection has been a source of contention at times with her workers, especially Hicks. "I'm a fine furniture maker," he explains. "I studied fine furniture for years. Perfect work is the only thing that's acceptable. You know what perfect work is, but that 'wrongness that's right' -- that's the eye of the beholder. ... Things were done different ways in those days depending on who was doing it." And sometimes, Hicks says, "her aesthetics kind of overrule sound building practices." At Cain's insistence, for example, the cedar clapboards on the outside are treated only with one coat of interior stain, which makes them curl in the summer heat. "There's not going to be any water intrusion from the outside because I do a lot of detailing on what's behind," Hicks says, but "it's going to look old really fast." Cain also was concerned about the height of the foundation. "You just feel an old house settling into the earth," she says, with no more than 6 inches of foundation showing. She wanted the same look for her home, but current building standards require at least 10 inches of clearance. Hicks did what he could to create the illusion of a lower-sitting house. "It's still too high," Cain says, but viewed from the hill above, it works. At one point, Hicks recalls, Cain even suggested he build the garage at a tilt, so it would look older. "That's where I drew the line," he says, chuckling. Understated and unflappable, Hicks is a perfect counterpoint to Cain's intensity. She credits his affable, easygoing manner with shepherding the project through a maze of building regulations and coordinating a host of subcontractors, all of whom were asked to work outside the norm. Many, like the plumber and electrician, had to return again and again, installing their pipes and wires one room at a time. "They have been so patient and so good," says Cain. "This thing has gone on so long, I know they would just like to get the whole thing over with." Cain likes getting to know the people working on her house, and over the past three years has cultivated personal relationships with many of them, in chats ranging from the practical to the philosophical. She is particularly close to Glenn Leonard, a Southampton carpenter who did a lot of interior finish work and now is building a garden shed for her. She and Law have joined these men for dinners and parties, and she considers them her friends -- good-natured debates notwithstanding. "Her genuine interest in the people who work there is really unique," says Hicks. "She really is good at bringing thought out from people in the questions she asks -- looking into the meaning of things, the meaning of life and how you live it." Most satisfying, says Cain, is when her workers share her delight in the project. She points to moments with Leonard, for example, following weeks of painstaking work. "When Glenn and I would achieve something, we would just dance up and down, she says, laughing. "They're glad I'm happy, but they're happy too ... It's so nice when somebody appreciates it."